Bulletin 1410 Motor Winding Heater is intended for use with 3-phase AC motors to guard against damage caused by condensation build-up on motor windings. This device is not intended to be used to dry out damp motors. 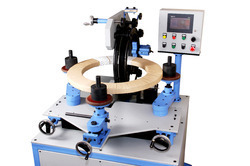 Being counted amongst the leading companies we are to offering a quality tested array of Toroidal Coil Winding Machine. These are manufactured using superior quality material which we brought form the authentic vendors of the market. Moreover, these require less maintenance and are delivered in a fixed time frame. Suitable for Mini Transformer, Power Suppler Transformer, Relay, High Voltage Ignition Coil and exchangeable Power Supply Transformer manufacturing etc. Number of Spindle: one spindles.